We’re havin’ a heat wave! Darn, is it hot here in Southern California. The kids have been coming home from school drenched in sweat and begging for some relief. Is it fall or summer? We’re confused. Anyway, we found the perfect way to cool off by using a little summer-meets-fall produce magic to make a sweet-tart pomegranate lemonade. It’s got just enough of a “zing” factor to put a little life back in your step after a long day in the heat. To make the lemonade, we started with these beautiful fall pomegranates from Melissa’s Produce (shown here mixed with red pears). 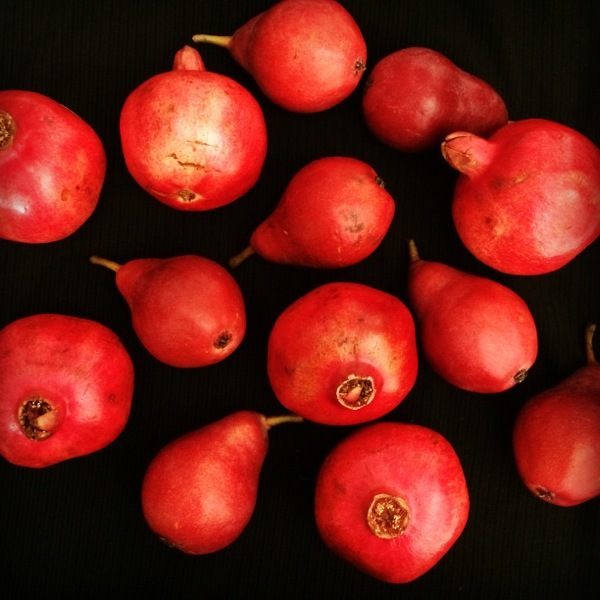 We’re not pomegranate experts over here and we researched (and tested) all sorts of different techniques for getting the juice out of the beautiful red seed drops called arils. At one point we had one kid meticulously peeling the pomegranates while another one filled a Ziploc baggie and used a rolling pin to roll out the juices. But in the end, the easiest and least messy way to juice them was to cut them in half and ream them with a lemon squeezer. (One “con” that we read about with that approach was that the juice might taste bitter, but we didn’t notice any bitterness when juicing them this way.) After that, we just mixed up the juice with fresh-squeezed lemon juice and lots and lots of ice. Oh, and a little mint too, for some of that extra “cool” factor. Make a simple syrup: Combine the sugar and 1 cup water in a medium saucepan; heat until the sugar dissolves and the mixture is simmering. Remove from heat and allow to cool. 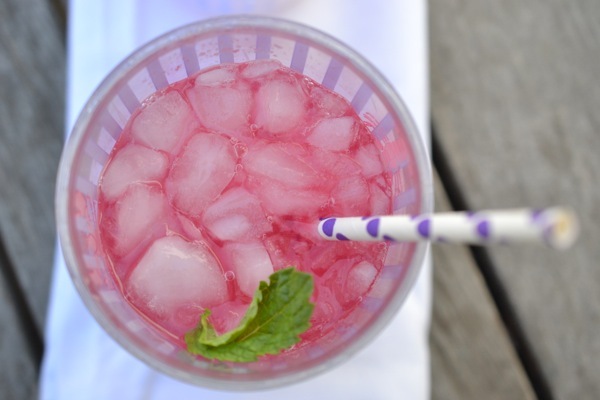 In a large pitcher, combine the pomegranate juice, lemon juice, simple syrup, water and ice. Adjust water level to taste. Serve garnished with fresh mint leaves. Serves 8 to 10. How perfect for this week! 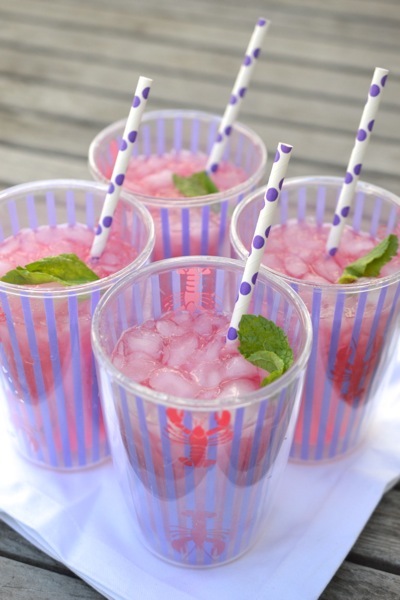 Looks so beautiful and refreshing! Thanks, Valentina! Hope everyone is a little cooler today!